I have long wanted to go to the historic, fortified walled city of Carcassonne, a UNESCO world heritage site, located in southern France, with its fairy-tale looking defensive double walls, castle, drawbridge, watchtowers and cobbled streets. Not only was I fascinated with it, I had read about and seen enticing photos of the five-star Hôtel de La Cité, located in the heart of the medieval citadel, and relished the idea of staying within the walled city. The hotel has the traditional, comfortable luxury that I favor, with inviting outdoor spaces and great views of the expansive valley below. I had initially flown directly from Alicante, Spain to Toulouse, in the region of Occitanie, scheduling the first three days in Toulouse. For the fourth day, I booked the Hôtel de La Cité. Carcassonne is only a short, scenic 40 minute train ride from Toulouse. Unfortunately, I misjudged how long it would take to get from my hotel in Toulouse to the train station due to having to navigate around the old town and to get a ticket for my dog from an agent. Fair warning, I was able to book my seat on the train via the internet but not for my small dog, which had to be done in person at the train station. 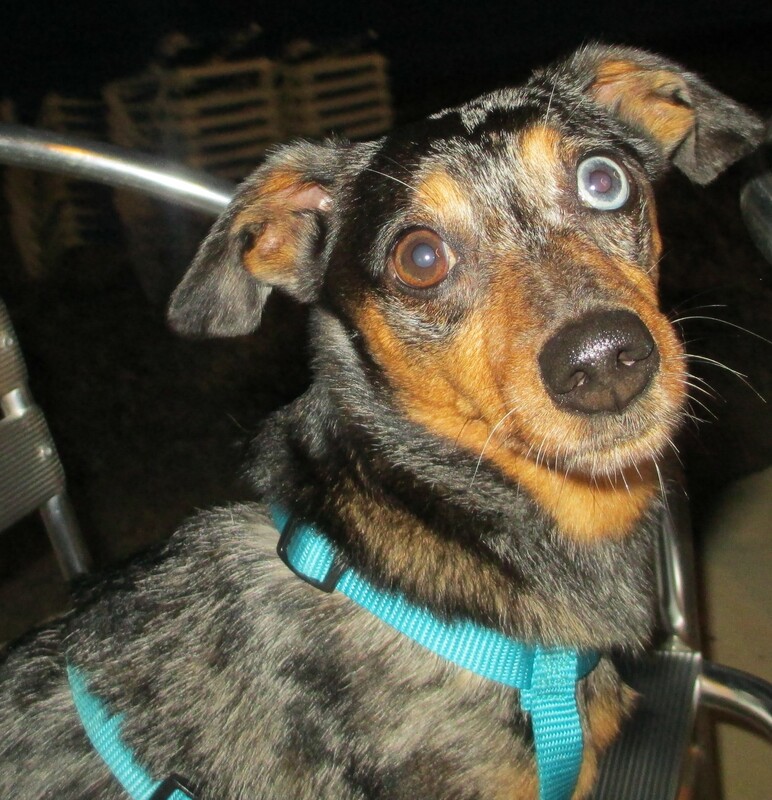 So I took the next train, an hour and a half later, with my small dog, Pepper, (AKA Pimienta) in his portable, wheeled carrier. The train station in Toulouse had a piano permanently located in the waiting area, and many people spontaneously sat down and played. It’s these little serendipitous things that contribute to my passion for travel. There was also a foosball table, which kids and adults stopped to play. Be aware that in many train stations in France you need to get to your train by walking under the train tracks via stairs. If you have mobility issues and/or a heavy suitcase, it can be challenging. Allow extra time or if you are disabled, request help when booking your ticket. Whenever I take public transportation like a train or bus, I try to go one timeslot earlier than my needed arrival time, in case something like this train trip goes awry. 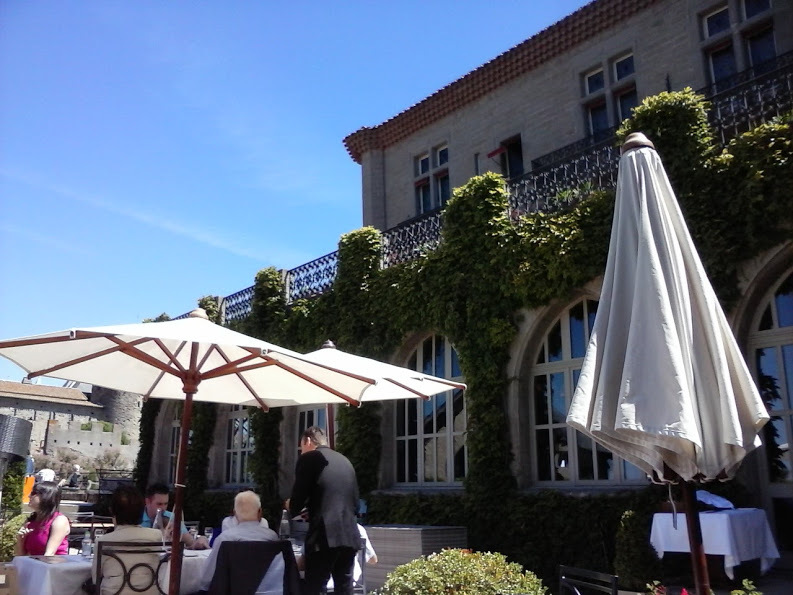 So even though I left an hour and a half later than initially intended, I still arrived on time at the hotel where I had scheduled to eat at the hotel’s Michelin star restaurant, Barbacane. 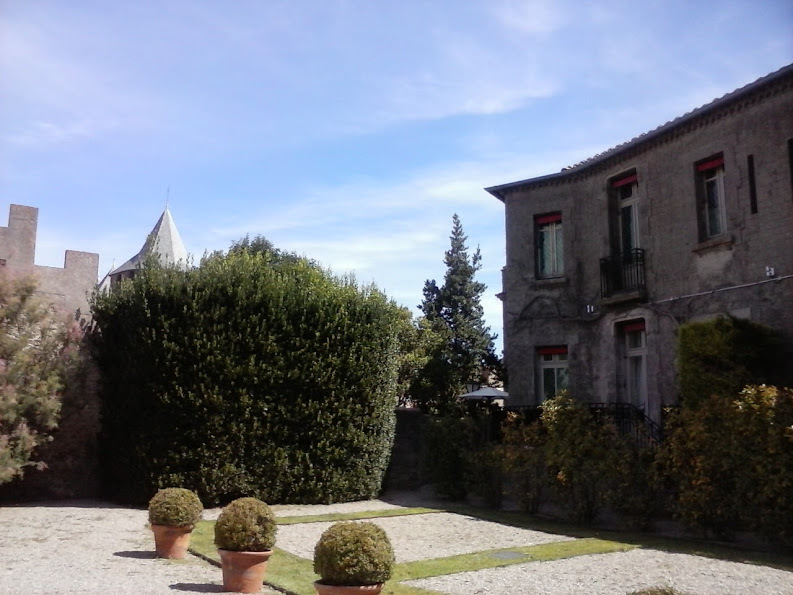 Lunch was in the lovely garden area with views of some of the wall, watchtowers, and the valley below where Carcassonne residents now live. The prix fixe three course lunch which included two courses, each served with a glass of wine selected by the sommelier to pair with the food. Water was included and a choice of dessert or a cheese plate at the end, all for a quality, reasonably-priced meal of €39. Pepper sat quietly under the table. After lunch, we went to my room, which was spacious, with elegant furnishings, a great bed and a menu offering a variety of pillows from which you can choose. Knowing I was bringing my dog, they gave me a room with stairs that led down to a garden area, where Pepper could do his outdoor duties. There also was a table and chairs on the upstairs patio. I was surprised and pleased to see they had a dog dish with water in the room ready for Pepper, the first time I have ever experienced that. And there was no extra charge for the dog, whereas normally there is. 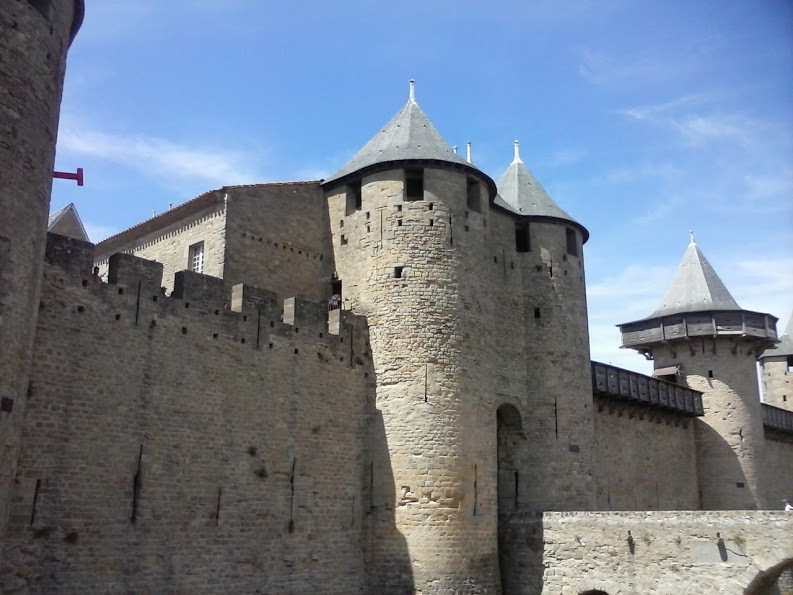 After settling in to the room, I went out to explore the rest of Carcassonne within the walled citadel. The area is pedestrian with the exception of an occasional delivery vehicle, but it was very crowded with summer day trippers. There are a few buildings and museums worth exploring. 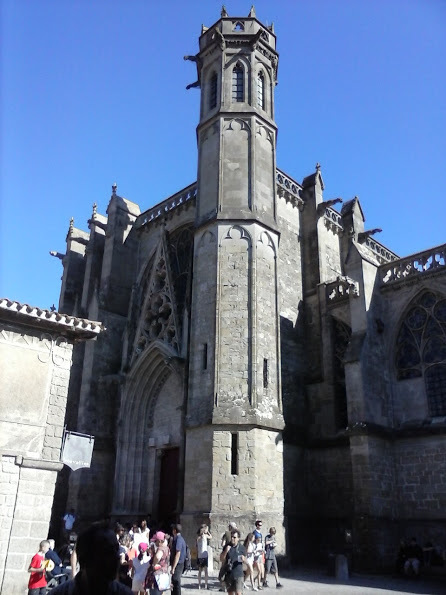 The Gothic-Romanesque Basilica Saint-Nazaire dates back to the 12th century and has beautiful stained glass. The rest of the buildings largely house touristic shops selling regional specialties including food (foie gras, cassoulet, truffles, and olives), local wines, knight-themed items, and cafes and restaurants. It felt more like a crowded theme park than a historic site. I had only booked one night at the Hôtel de la Cité, as I first wanted to see if I enjoyed it enough to stay longer; I was glad I did. I considered exploring some of the other areas of Occitanie, but ultimately decided to head back to Toulouse and explore it further. I used the internet to find a last-minute hotel reservation for the next three nights in a different area of Toulouse than my initial stay. After I arrived, I told the taxi driver the name of my hotel, he said it was just a short distance, waving his hand toward a large boulevard. So I walked, and walked, and walked. The hotel was not straight down the street, and I wandered for a while, luggage and dog in tow in the heat. I stopped for a cooling beverage, where I could ask the staff for directions. Feeling slightly refreshed and optimistic, I again set off for my hotel. An unexpected finding was that there were three hotels within a two block area that had the same name as the one I booked. Well actually, the main name was the same, with a slightly different second name. I finally found my hotel, which I initially found shockingly spartan after my stay at a five-star hotel. After I got over my initial dismay, I found the room adequate, particularly as I don’t spend much time in my room, and it was a dog-friendly hotel. I spent the next three and a half days in Toulouse exploring different neighborhoods, historic sites, and scouting out delectable food. I am already thinking about a return trip to Toulouse.